Celebrating 10 years of culture and community in Rogers Park! | Give what you can! Acclaimed by the Chicago Reader for its eclectic lineup of world music, curated by Sound Culture Center for Global Arts, Celebrate Clark Street Festival has grown from a community celebration into one of Chicago’s most renowned street festivals, attracting over 30,000 people annually. The festival presents world music and dance acts from around the globe, as well as cutting edge local bands on two stages. Featuring NOVALIMA (from Peru) | SYSTEMA SOLAR (from Colombia) | CENTAVRVS (from Mexico) | KINOBE & WAMU SPIRIT (from Uganda) | MEGITZA QUARTET (from Poland) | FUNKADESI (World Fusion from Chicago) | SENEKE WEST AFRICAN ENSEMBLE (from Chicago) | ENSEMBLE SURABHI (IndoAfrican Flamenco Fusion from Chicago) | BOSSA TRES (Brazilian from Chicago) | OPPOSITION PARTY (AfroFunk from Chicago) | SANGRE MICHOACANA (Tierra Caliente from Chicago) | ROYALE POLYNESIAN REVUE (Polynesian Dance from Chicago) | ODE (Balkan Rock from Chicago) | CUMBIASAZO & FUTURE ROOTZ DJ COLLECTIVE (Global Bass from Chicago) featuring DJ LUCHA LIBRE (Tropical Bass from Puerto Rico) | And much more! This festival is one of the last independent street festivals in Chicago that is locally managed and organized by a community organization – Rogers Park Business Alliance. The festival reflects the unique diversity in Rogers Park by presenting music from all four corners of the world encouraging audiences to dance and experience local, national and touring bands. The festival provides two live music stages, food from local restaurants, beer, wine and micheladas from local bars, interactive entertainment throughout the festival area, an Art Lot, kids’ activities, and a meeting space for the community. 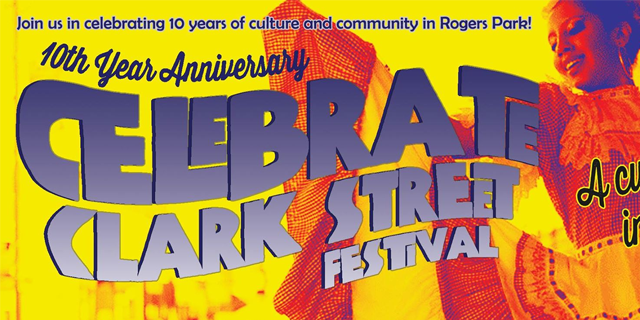 Celebrate Clark Street will take place on Clark Street between Morse Ave. and Estes Ave. in Rogers Park and a $5 per person ($10 per family) donation is requested. Proceeds help fund programs such as the beautification of commercial corridors and the Glenwood Sunday Market in Rogers Park. Celebrate Clark Street Festival promises something for everyone!